Writing a postcard at the Café de Flore terrace ? Where ? 6th Arrondissement (St-Germain – Luxembourg), at the corner of the Boulevard Saint-Germain (172) and the Rue St. Benoit. Famous visitors ? 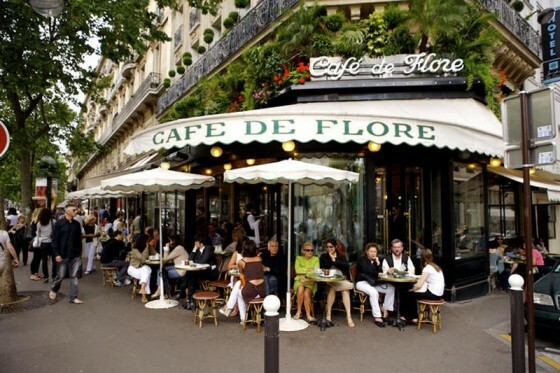 Many writers and artists, Sartre, Camus, Picasso, and Apollinaire frequented the Flore. Decor ? Art Deco interior of all red seating, mahogany and mirrors.